Zero-day Shadow IT Discovery - Automatic discovery and classification of hundreds of thousands of unsanctioned cloud applications. Zero-day Unmanaged App Control - Patent-pending automatic detection and control of data leakage paths in any unmanaged application. Zero-day Malware Protection - AI-based known and unknown malware protection, powered by Cylance. Zero-day Managed App Control - Data protection, threat protection, identity and visibility for any SaaS, custom, or packaged software application. No catalog, signatures, or changes to application required. Zero-day Agentless Proxy with AJAX-VM - Provides robust, agentless reverse proxy for any application. 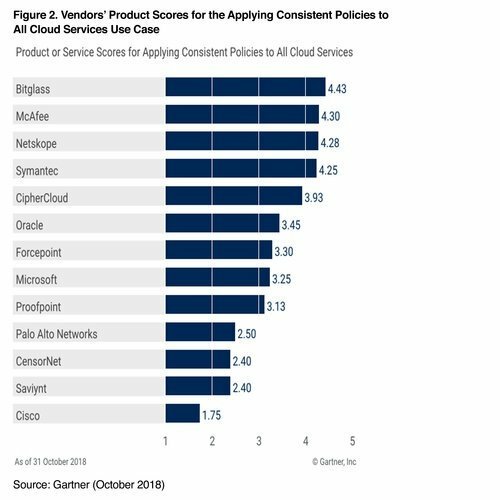 Gartner's recent research piece ranks Bitglass tops for consistent policies across cloud applications.